At the U.N., Venezuela’s Jorge Arreaza compared the economic blockade to the economic war waged against Chile’s socialist government in the seventies. 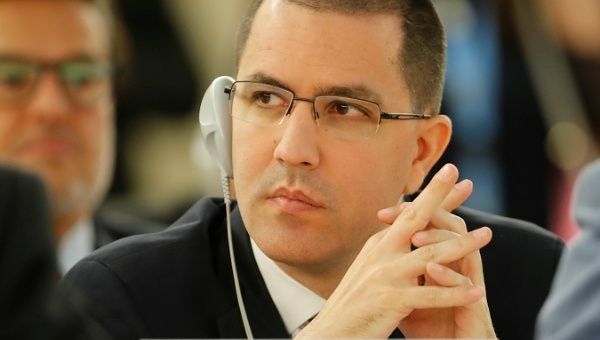 Sept 11 (teleSUR) Venezuela’s Foreign Affairs Minister Jorge Arreaza has condemned attempts by the United States and the European Union to destroy Venezuela’s economy and vowed that its government will continue to “fully collaborate with the universal human rights system” during the 39th session of the United Nations Human Rights Council, which was held Tuesday. Arreaza welcomed the recent change in leadership at the council, which is currently headed by former Chilean president Michelle Bachelet. “When saying the United Nations lies, it wasn’t the United Nations, it was the former high commissioner Mr. Zeid (Ra’ad Al Hussein) with his report, written without visiting Venezuela,” Arreaza said. The foreign minister also denounced international sanctions and acts of aggression against Venezuela and highlighted the similarities between what Venezuela is facing today and the economic war waged against Chile in the early 1970s, during the tenure of democratically-elected socialist president Salvador Allende. “We denounce the siege against Venezuela, the economic and financial blockade of our country. The United States and European Union’s coercive economic measures against our country that try to harm our economy like they did to Chile in 1971, 1972, and 1973. It has even made it difficult for Venezuela to obtain what is most basic for production, for feeding our people, to provide health,” Arreaza said on September 11, the day which marks the anniversary of the 1973 military-led coup d’état against the Chilean government and Allende’s assassination. “45 years later, actions continue to take place, directed and conducted by United States power to frustrate the dreams of the people of our America,” Arreaza said as he highlighted attempts to oust Venezuelan president Nicolas Maduro. He also cited a recent report published by the NYTimes, which provided accounts of meetings between U.S. officials and Venezuelan military officials who attempted to organize a plot to remove or assassinate Maduro. Arreaza stressed that the country won’t allow what happened 45 years ago in Chile to happen again in the Americas, and said the government has responded to the economic crisis by strengthening its social security system.